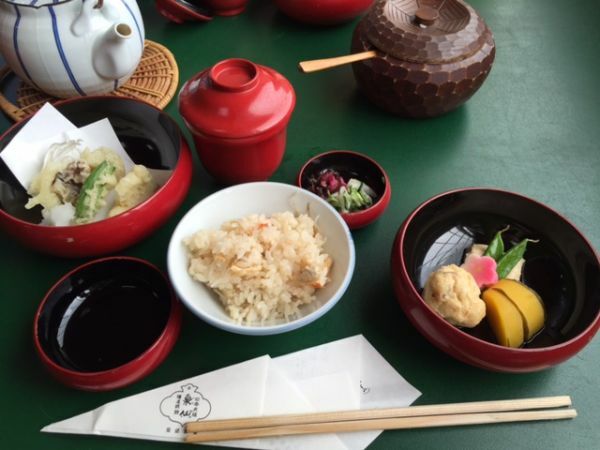 We have some Japanese vegetarian restaurants in temples in Kyoto. 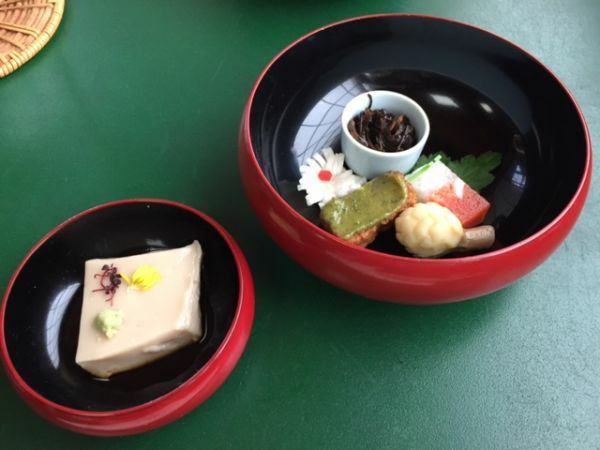 The dish is called “Shojin Ryori”, which means the training for Buddhism. 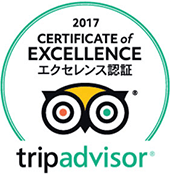 Izusen in Daiji-in, Diatokuji temple is one of them. Shojin Diet is different from the meal in tea ceremony, because it’s vegetarian and the order of the meal is different. 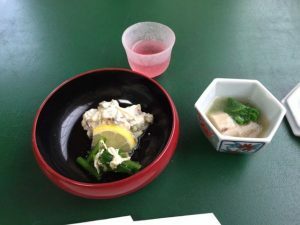 But it’s still useful and valuable to learn the simple Japanese tastes and what kind of seasonal foods are used. In addition, it’s simple tasty meal everybody in variety of religions can enjoy. 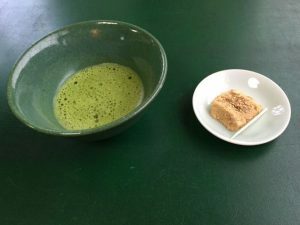 Shojin meal is for the training of Buddhism. It’s impossible to kill living animals, so only vegetables and beans are cooked with great care. We can enjoy the real taste of the ingredients. This is the menue called “Ayame” in Izusen. First, matcha and small dumpling made of bracken starch. The grape vinegar and salad dressed with tofu etc. Tofu made of sesame, food made of wheat gluten with miso paste, and kelps. Rice, tempura, boiled vegetables, and pickles. I feel my heart become calm after eating these kind foods. Shojin relates to Zen Buddhism, which is also the spirit of the tea ceremony. I’ve found some Zen words are written on the paper for chopsticks. It’s said living and death are eternal theme for human as well as Zen Buddhism priests. But time flies so fast that we feel the sense of mortality. We have to try our best for every moment, every day. I guess it means we must think every moment, every day as importance. It’s same as the meals. I’d like to thank to all crops and people who cooked meals for us. Izusen is the restaurant of shojin meal. They use the red bowl the priests traditionally use here. This small bowls are said to be imported from India in Nara period (710-784). 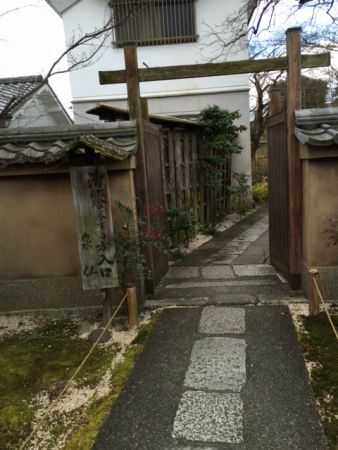 Izusen has 3 restaurants in Kyoto, and Dijiin branch in Daitokuji temple is one of them. 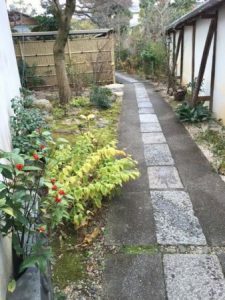 Walking the narrow path, we can see some Japanese flowers and trees. Even in winter, red fruits “senryo” were beautiful. They had big tour group from 1st to 2nd floor when I visited. I have met people wearing kimono come and have lunch here after the tea ceremony in Daitokuji temple. We can have calm delicious food here.